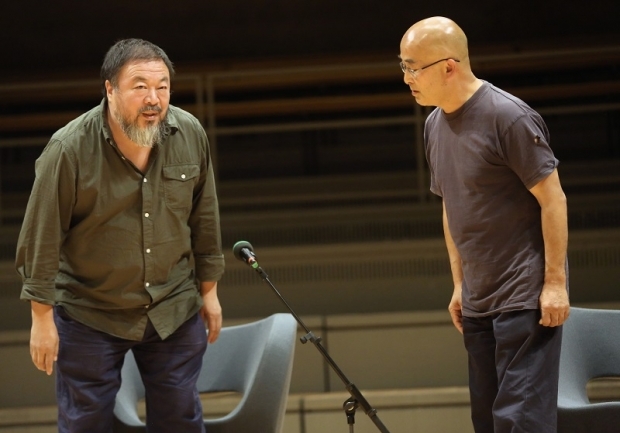 Chinese dissidents artist Ai Weiwei (left) and poet Liao Yiwu attend a panel discussion at the Berlin International Literature Festival on September 2, 2015 in Berlin, Germany. Ai and Liao participated in a conversation about literature, contemporary art, and their relationships with Chinese authorities. Liao had been imprisoned for four years in 1989, and in 2011 Ai was detained and beaten by security officials and then imprisoned for 81 days, only to reclaim his passport this past July, after which he went to Germany to meet his partner Wang Fen and their son Ai Lao. This piece was first published on the NYR Daily on September 12, 2015. Ai: If you don’t understand politics you are a victim of politics. So he was baffled by everything. But those who participated in politics were even more miserable. For example Hu Feng [the Chinese writer and literary theorist who criticized Mao’s theory of art and was imprisoned for 24 years], or a lot of people like that, they basically were drowned and finished. Because this political party does not permit dissent to the extent that you can’t make a sound. It doesn’t allow you to exist. What do you think of the modernization theory—that when people get to a certain standard of living, when people are no longer just concerned with food or shelter, they start to demand things. We could see that historically in South Korea, or Taiwan, say 30 years ago. Does that have any relevance to China today?